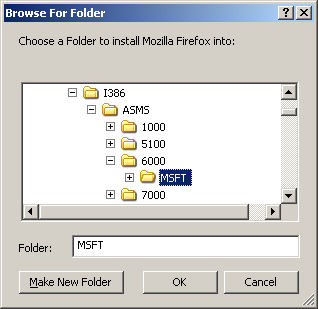 I'm getting really mad at that braindead "Browse For Folder" dialog box which many applications seem to like using. I guess the dialog is really a Microsoft invention supposed to make life easier for braindead users. Maybe it does for them, but I doubt it. Anyway, for any normal person, it only makes it extremely difficult to create a new folder. What is particularly disheartening is that it seems to be mainly the open source apps which use it. 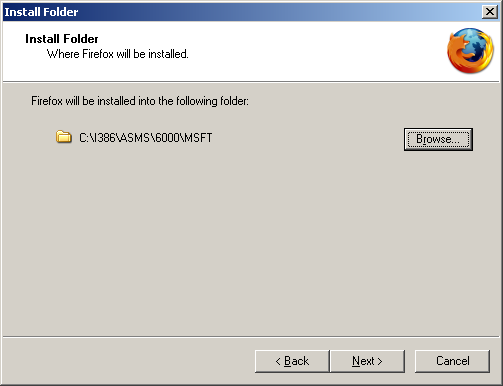 This example shows the dialog when installing Firefox. But I have had to endure it with many other apps. 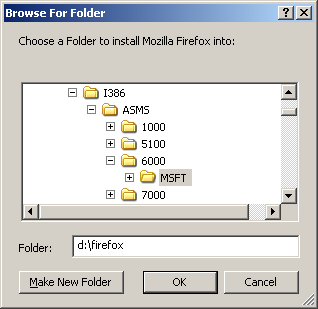 So, let's say I would like firefox installed in D:\firefox instead of C:\Program Files\Firefox. I click on "Browse..." and what I expect is having a choice of browsing to there, or just typing or pasting into an edit box, which is usually much faster and easier.